FREE Sonic Spinbrush at Walgreens + Money Maker! Starting tomorrow, you can get an awesome freebie at Walgreens! = FREE + $1.01 Money Maker! 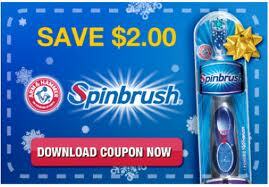 NOTE: I don't have the Dec coupon booklet, but I heard it MAY not match the brush that is on sale! UPDATE: My Walgreens would not accept the $3/1 coupon, but I still got a great deal!